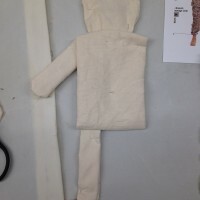 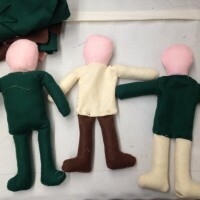 I began making the dolls by creating a muslin prototype, based on a sketch, of the arms, torso, head and legs (the arm and leg I simply repeated) and then created patterns from that prototype. 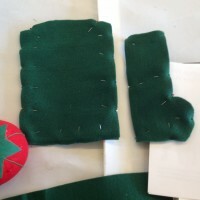 In order to convey a more childlike appearance, I chose not to use a camouflage fabric, and used felt instead. 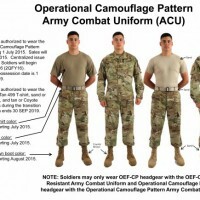 I wanted to simplify both the form of the soldier and his uniform, breaking the camouflage pattern down to three basic colors (green, khaki, and brown) and the skin to a generalized, fleshy pink. 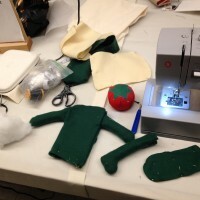 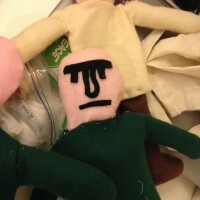 I then machine and hand sewed the fabric and stuffed them with fiber-fill.